I know I'm not the only one out there that has sensitive skin. Within a few days of using something that my skin doesn't agree with I start getting really itchy and have to stop using whatever product it is that's causing the irritation. Both the Aveeno and Neutrogena sunscreens are quite thick, and don't spread as nicely as a lotion typically does. Surprisingly, I found that they left a white film on my body all day because they were not soaking into my skin properly, and then I had to scrub really hard in the shower to get the film off of my skin. 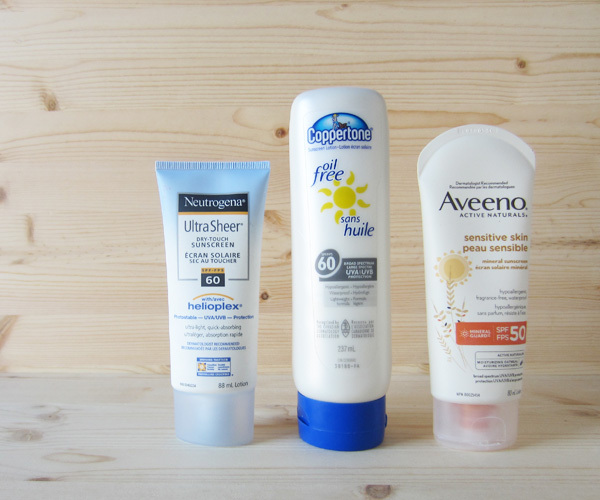 The Coppertone sunscreen has been my favourite, but, although it says that it's oil free, it does leave you a bit greasy until the sunscreen soaks into your skin -- which it actually does for me. It's easy for me to spread all over my body -- except for my back...can anyone actually get sunscreen on their back by themselves? -- and it doesn't leave a white film on my skin that I have to scrub off at the end of the day. The best thing is is that it's fragrance free, which makes my skin very happy. What's your favourite sunscreen to use?